Soil net nitrogen (N) mineralization and nitrification as well as gross nitrification rates were studied in a forest soil within a 30 × 18m homogeneous plot located in an N saturated mature spruce stand at the Höglwald Forest (Bavaria, Germany) in order to explain the small-scale variation in nitrate (NO3 −) concentration in seepage water. Seepage water was sampled below the main rooting zone in 40cm depth with suction cups over two periods at 20 measuring spots respectively. The sampling spots were uniformly distributed over the plot for both sampling periods, and represented the whole concentration range of seepage water NO3 −concentrations measured within a close mesh of 121 suction cups. 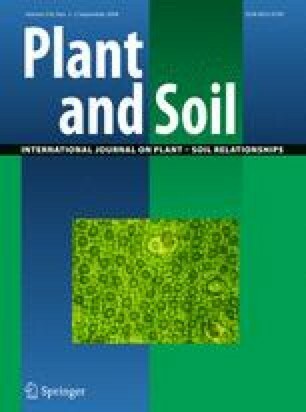 At each measuring spot soil net N mineralization, gross and net nitrification, heterotrophic soil respiration, extractable soil ammonium (NH4 +) and NO3 −, and additional physical and chemical soil parameters were measured in the organic layer and correlated with the NO3 − concentrations in seepage water. Furthermore, the effects of environmental parameters on N conversion processes were evaluated using multiple linear regression analysis. We found that the small-scaled variations in seepage water NO3 − concentration were related to similar small-scaled variations in key processes of microbial N turnover rates in the organic layer. Within this study net N mineralization in the organic layer could explain 51–59% of the corresponding small-scale variation of nitrate concentrations in seepage water below the main rooting zone using a multiple linear regression model with stepwise procedure. In addition, we found that small-scale patterns of N turnover in the organic layer were strongly influenced by water content in the organic layer and the dry mass of organic matter. The authors thank G. Willibald, C. Brümmer, P. Rosenkranz, L. Zumbusch, A. Göttlein, and W. Weis for the technical assistance and scientific advice, P. Haas, L. Chlopik and M. Bauer for a helpful hand, the collection of samples and support in the laboratory. This work was funded by the Deutsche Forschungsgemeinschaft (DFG) under contract number PA 442/5-2.